Books-A-Million retail book outlets will open in the recently vacated Border Books and Music stores in Bangor (pictured) and in Portland. The Bangor store is slated to open in early November. Alabama-based Books-A-Million plans to open its first Maine locations in Bangor and South Portland by mid-November, in spots that until recently were Borders stores. It also will open a smaller store in Auburn, where Borders had operated a Waldenbooks at the Auburn Mall, according to company spokesman Bill Todd. Books-A-Million did not acquire a fourth Borders property in Maine, in Brunswick. The economic development office in that town had no information about any interest in the former Borders store there. 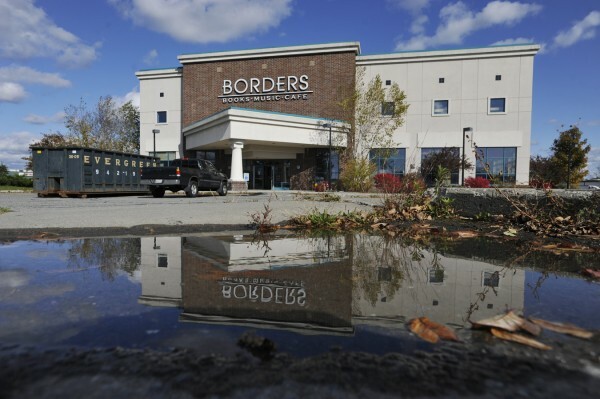 The Borders chain went bankrupt this summer, and the Maine stores closed earlier this fall. Books-A-Million acquired 39 Borders properties through the bankruptcy, expanding its reach into New England and the mid-Atlantic states as well as the Midwest. The plan is to open the stores around the same time, said Todd, and the company has been busy remodeling the interior of the stores, transforming the former Borders to Books-A-Millions. In addition to making the stores look like Books-A-Millions, the company is installing the point-of-sale technology and other support structures necessary, he said. Todd said he wasn’t surprised to hear the Bangor and South Portland Borders locations were reportedly among the Borders chain’s highest performers nationwide. “The Bangor market overall is very appealing for readership — there’s a high concentration [of people] in Bangor and in Maine overall who like to read — they like books, they like literature and they like to be around books,” said Todd. Todd said he didn’t have exact numbers, but the company was hiring a work force comparable to what had been at the three stores under Borders, with information about job openings at the Books-A-Million website. According to state estimates, the closure of Borders cost Maine up to 137 jobs between the four retail locations. While Books-A-Million’s website only listed eight openings for Maine, some presumably had been filled, some position listings would apply to multiple openings and more may be open in the future. The South Portland and Bangor stores will each feature a Joe Muggs coffee shop, which is part of the Books-A-Million brand, said Todd. They will also carry DVDs, audio equipment, audio books and Nook e-readers and products, he said. “We’ll have old tech and high-tech in there at the same time,” said Todd. The stores in the south have robust religion sections, and some in the publishing industry have questioned whether those sales would be as strong in New England stores. Todd said a “cookie-cutter” approach wouldn’t work in new properties. He said the stores will look at what customers want, where demand is and then respond with offerings. The new stores will benefit not only consumers but other businesses. Book publisher Dean Lunt, a Frenchboro native and owner of the Yarmouth-based Islandport Press, said he has had contact with Books-A-Million and noted that the company tends to stock regional books by local presses such as his. Islandport is an 11-year-old regional publisher that employs five, putting out eight to 10 books a year with a catalog of more than 40 in print. The books include Maine classics such as “Bert and I” tales along with new books by Mainers, such as “Where Cool Waters Flow” by Randy Spencer. “Given the situation in the industry, any time a bookstore opens it is a good thing — especially a bookstore with the finances and the reach and the marketing power of someone like Books-A-Million,” said Lunt. Lunt said he also thought Books-A-Million stores would benefit other bookstores in Maine by keeping people interested in books; keeping the physical offering in peoples’ minds. Borders’ bankruptcy still hurts many businesses, large and small, such as Lunt’s Islandport Press. “Borders was a major customer of ours. We obviously lost all of the 2011 sales, which is significant, and we have not seen any money from the November, December sales of last year,” said Lunt, adding that he understands there will be some kind of settlement coming, but that he doubted he’d see more than 5-10 cents on the dollar for what his business is owed. The decline of Borders has been a study in how changing technology continues to impact traditional industries, with increasing numbers of consumers turning to e-readers and online retailers like Amazon to furnish their needs. In 2003, at its peak, Borders had 1,249 stores. In February, when it filed for bankruptcy, it had 642 stores. Books-A-Million faces those same pressures. In its Aug. 23 second-quarter filings with the Securities and Exchange Commission, the company reported a net loss of $2.9 million compared with profits of $1.9 million in the same period in 2010. Books-A-Million, which trades under the symbol “BAMM” on the NASDAQ, said its revenue fell 11.4 percent to $106.4 million from $120 million last year. “A soft publishing lineup, the effect of e-book migration and the impact of Borders’ liquidation all contributed to the decline in comparable-store sales,” said Books-A-Million CEO Clyde Anderson in the filings. Todd on Monday said the company had high hopes for its latest properties, given their past performance in their respective markets.